My fiancé and I both have an incredible sweet tooth, but I know I can’t constantly be grabbing a bar of chocolate each time I’m craving something sweet. Instead of whipping up a batch of cookies, I decided to play around with a few ingredients to make some sort of no bake protein dessert. Peanut butter and chocolate always mix well together, so those were my two main starting ingredients. I added oats into this recipe in order to hold everything together and coconut oil as my go-to ingredient for flavor. Stir oats, peanut butter, honey, dark chocolate, coconut oil, and protein powder in a large bowl until all ingredients are fully combined. Cover mixture with plastic wrap and refrigerate for 30 minutes. Scoop chilled mixture into your hand and form into balls (I chose to flatten mine out a little). Place protein clusters on a baking sheet lined with parchment paper and be sure to keep cool until serving. Keep remaining protein clusters that aren’t being consumed refrigerated before eating and enjoy the rest! 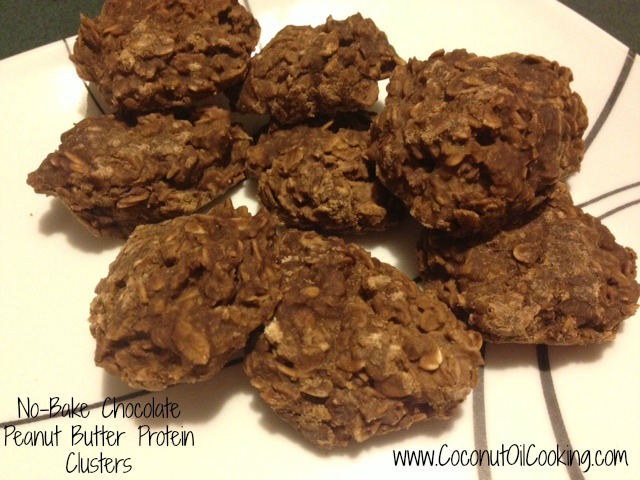 As you can see, I did use honey and dark chocolate in this recipe to give the no bake protein clusters a little sweetness. I do feel better that the honey is an all-natural sweetener and I didn’t have to add any sugar. You can also omit the dark chocolate morsels if you prefer to keep it simple. 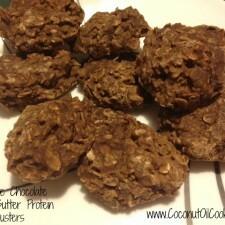 If the recipe was a hit in your book, try doubling the recipe for even more chocolate peanut butter protein clusters! For more protein recipes, be sure to check out my Chocolate Coconut Protein Bread and Pumpkin Protein Pancakes.